The film-within-a-film, "The Russian Affair" - the hero escapes Bolshevik captivity to continue the fight for a free Georgia. 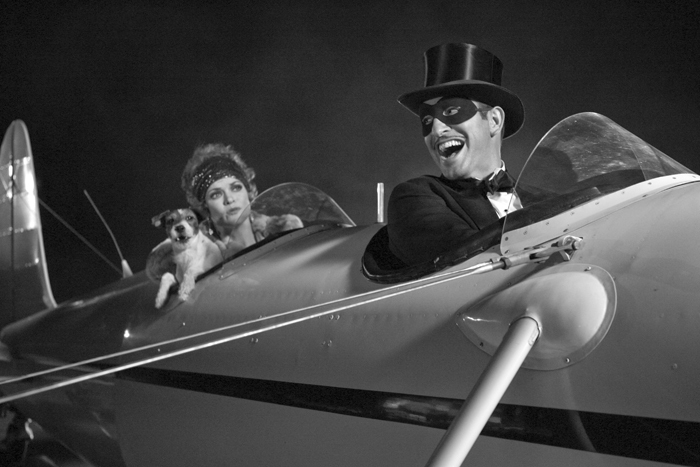 The opening scene of Michel Hazanavicius’ new film, “The Artist”, is a movie within a movie. My guess is that Hazanavicius was looking for something that would seem authentic in the 1920s, something sufficiently obscure that it would have an air of being genuine. To have the hero of this adventure fighting for Georgia is about as obscure as you can get. I’m sure audiences in the USA are convinced that it must have something to do with the state of Georgia. In the 1920s, the plight of the formerly independent Georgian republic was very much in public view. And this was particularly true on the left. Georgia, which had been a province of the tsarist empire, declared independence in 1918 and was led by Mensheviks. In 1921, the Red Army invaded — probably at the instigation of Stalin, and without the knowledge of Trotsky. The Mensheviks were quickly routed and many of their leaders fled to exile in western Europe. From there they continued a long struggle to delegitimise the Russian occupation of their country. A large part of the struggle took place within the international socialist movement. Leading socialists from across Europe travelled to Georgia in its final months, the most prominent of these being Karl Kautsky. Kautsky wrote a book praising the Menshevik success in Georgia, citing it as an example of a democratic socialist alternative to Bolshevism. He contrasted the multi-party system, free press and independent trade unions of Georgia with repressive regime in Soviet Russia. Trotsky countered with a vitriolic attack on the man formerly known as “the pope of Marxism” and defended what turned out to be the first successful Soviet invasion of a neighbouring country (others were to follow). In Britain, the cause of Georgia was so well-known and widely discussed that the TUC eventually sent a trade union delegation to investigate. For years the Georgian social democrats in exile participated as honoured members of international socialist congresses. Just three years after the Red Army seized Tbilisi, the Georgians rose up in a violent insurrection against Soviet rule. Leaders of the Menshevik People’s Guard led the uprising, but it was eventually crushed. Within a decade there was little left of the Georgian Mensheviks in their homeland. The new Georgian Soviet Socialist Republic was the kind of place where psychopath like Lavrenty Beria could rise to power. Beria was so successful in brutally terrorising the local population that Stalin eventually promoted him to head the secret police throughout the Soviet empire. Though the Mensheviks died off one by one in exile, the memory of Georgian independence never did. Georgia remained for decades a centre of anti-Soviet activism, culminating in mass street protests in the 1980s. When the Soviet Union collapsed, the Georgians proclaimed independence and chose as their symbol the flag of the short-lived Menshevik republic. They made the date of the Menshevik’s declaration of independence their national holiday. And for a few years at least, the constitution of the Menshevik republic was back in force. But the 1990s were to prove a turbulent time in Georgia, with civil wars and a series of failed leaders. The country is currently ruled by the right-wing Saakashvili regime, whose record on workers’ rights has attracted the attention of the international trade union movement. One of the first things Saakashvili got rid off when coming to power was the hated crimson flag of the Mensheviks. To Michel Hazanavicius, the slogan “Long live free Georgia!” must have seemed to be as obscure as it gets, a historical curiousity, something that would appeal only to trivia buffs. But to socialists, “free Georgian” is a reminder of a historical tragedy.